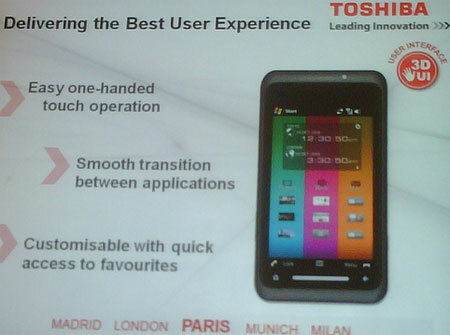 Finally, an honest to goodness Qualcomm Snapdragon device is about to land in the form of the Toshiba TG01. The 9.9-mm thin handset will feature a 4.1-inch WVGA (800 x 480 pixel) touchscreen display, HSDPA data, GPS, WiFi, a microSD slot, and custom Tosh 3D GUI to hide the Windows Mobile 6.1 uglies within. Most notable is that 1GHz Snapdragon chip that Toshiba claims makes the TG01 considerably faster than any device currently on the market with the promise to "revolutionize the mobile entertainment world." Perhaps that's where the DivX support comes in? We'll see when the TG01 is unveiled at Mobile World Congress in less than two weeks followed by an expected summery launch. One more picture after the break. Update: Oh man, the hands-on photo galleries from the London launch are coming up over at Pocket-Lint and Electricpig, the latter with head-to-head pics of the TG01 against the 12.3-mm iPhone 3G chubster and BlackBerry Bold. She's definitely a slim-lined beauty but we have our doubts about that stripey UI. Hey Tosh, where's the Android OS we saw running on Snapdragon at CES?